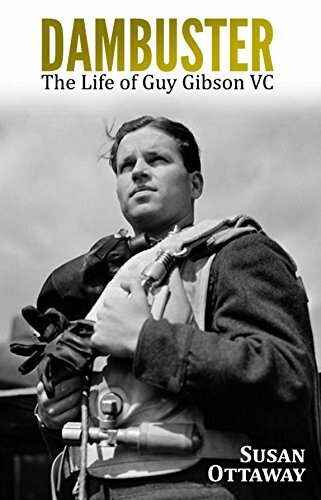 Dambuster: The Life of Guy Gibson VC is a must-read for anyone with an interest in military history. Author Susan Ottaway, an acclaimed historian, has written a moving account of the life of this distinguished WWII airman. The book paints a sad picture of an unhappy childhood. His parents separated whilst the family lived in India; his mother returning to England with Guy, his brother Alick and sister Joan. Her lack of parenting skills and subsequent descent into alcoholism meant the siblings were often neglected. His father was a cold, uncaring man who wanted little to do with his children; preferring instead to pursue his own selfish needs. Despite his dysfunctional background, Guy was determined to make a success of his life and remained close to his brother and sister. In 1936 he joined the RAF and after several postings and promotions led 617 Squadron on the famous Dambuster Raid in 1943. Later that year he was awarded the Victoria Cross and at the age of just 24 he had become the most decorated man of the entire war. His life was tragically cut short in 1944 when he died in an air crash over Holland. The book brings to the forefront the sacrifice and bravery of servicemen during WWII. It's an extremely well-researched and well-written account of an incredible man who gave his life for his country. I very much enjoyed the writing style; it wasn't too bogged down with facts and figures. Everything was presented in way that could be easily understood and digested. Reading it has given me a greater understanding and depth of knowledge of this period in our history. My thanks to author Susan Ottaway and David Haviland at Andrew Lownie Literary Agency for a copy of this book. FEW MEN HAVE A BETTER CLAIM TO BE CALLED A LEGEND IN THEIR OWN LIFETIME THAN GUY GIBSON. Leader of the famous Dambuster Raid of May 1943, which became part of the popular folklore of the Second World War after the film in which Richard Todd took the part of the hero, Gibson himself was tragically in an air crash in 1944. Born in India in 1918 and brought up in England, Guy Gibson joined the RAF in November 1936. Thereafter his career can be seen as a battle between, on the one hand, his uncertain temperament and less than ideal private life, and, on the other, his undoubted skills as an airman and as a leader of men. The war was to bring him adventure and, later, fame. He took part in the first aerial attack of the war, on the Kiel Canal; he served in Fighter Command and then, in 1943, came the famous raid on the Mohne and Eder dams for which he was awarded the Victoria Cross. By now a hero of international fame, he was sent on a Public Relations tour of North America, but he was above all a flyer and, refusing to remain grounded, he died an airman’s death. This new edition, which draws on conversations with members of Gibson’s family and on notes made by his widow, expands upon his early life in a severely dysfunctional family, his unhappy marriage and the possible reason for his untimely death in September 1944.